The stock market has surged lately and a lot of analysts credit it to stock buybacks by corporations. 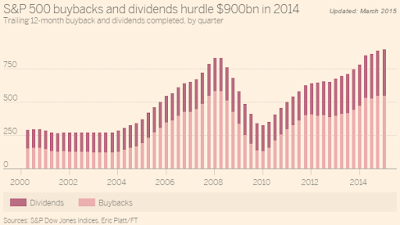 As the chart here shows, buybacks have reached dizzying heights. Corporations are purchasing their own stocks because corporate profits hit record levels last year and management can find no better use for the cash than to give it back to the owners through larger dividends or buybacks. As I wrote recently, record corporate profits, the current level of optimism and the low yields on debt justify the current loftiness of the market. This is not a bubble, but most investors are wondering what will shoot down this high flying market? Corporations appear to be the last buyers standing because “mutual fund managers have the lowest cash levels in history and money market fund levels are lower now than in 2007 and near a record low from 2000 relative to the capitalization of the stock market." Caterpillar is just one company, but if it represents the tip of the capital goods production iceberg, then the Ricardo Effect moment must be close. In other words, we may be in a recession now and not know it. How can that be? The keepers of the statistics on business cycles, the National Bureau of Economic Research (NBER), can identify recessions only after the fact. Essentially, the NBER sees two quarters of shrinkage in the GDP and declares that to be the bottom of the recession. Then the elves scroll back through the data to find the quarter with the highest growth, such as Q4 of 2014, and declare that the peak of the business cycle. The periods of declining GDP in between constitute the recession. The stock market gets credit for predicting recessions when it crashes only because that usually happens before an NBER announcement, not before the actual recession began. The Bureau of Economic Analysis will release the data on corporate profits for Q1 at the end of this month. If there is a significant decline in the year-to-year change, most analysts will dismiss the data as a result of a cold winter. But it could be the first quarter of the next recession, in which case the stock market will soon respond by collapsing. And, as the chart above shows, corporations are great at timing the market so that they buy back most of their stock at the market peaks.